For $10 this site will create for you your own personalized Nintendo Wii game character, or "Mii." 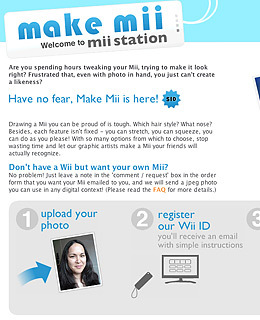 You upload a digital photo of yourself or someone else, register your Wii's ID, and when the Mii is ready (it takes a few days) you use your console's built-in Wi-Fi to download the avatar to your machine. (You can also buy an adapter that lets you connect your Wii to the Internet using an Ethernet cable.) Legions of Wii fans use Miiplaza.net to make their Miis available to the masses; choose from among the 8,000 or so characters in the database. There are Miis based on celebritiesthere's a Paul Giamatti, Mick Jagger and a Mr. Tand popular Sci-Fi characters (Cyclops, Storm Trooper). The Music category has Weird Al, David Bowie and Dee Snyder.